Now that daylight savings has ended and we head reluctantly into the winter months, many parents may be wondering where to find fun, indoor family events that won’t break the bank. Fortunately, the UAB and Samford basketball teams are kicking off the 2016-17 season. Both UAB and Samford are NCAA Division I programs, with the Blazers competing in Conference USA and the Bulldogs playing as members of the Southern Conference. College basketball games are exciting for kids, as they can participate in contests and promotions to win prizes, get autographs from players and coaches, and learn a lot about the sport of basketball. Both Samford and UAB offer men’s and women’s programs, giving local families plenty of opportunities to take in a game. Blazer women’s head coach Randy Norton says attending college basketball games gives kids the chance to develop relationships with the players and coaches, who are great role models. UAB women’s basketball has a program called Blazer Ballers for local youth. For $25, each member receives admission to all women’s home basketball games during the year, a t-shirt, court-side access for pregame team warm-ups and player introductions, a post-season party with the team, and invitations to other members-only events. This program is offered to kids in 8th grade or younger. Regular ticket prices for UAB women’s basketball games are $5 for adults and $3 for youth (17 and under). UAB women’s basketball will host a family night against Florida State on December 10, offering two adult and two youth tickets plus a concession stand voucher for $12. For men’s basketball games at UAB, youth tickets are the same as adult tickets unless there is a special online promotion. Normal ticket prices for non-conference games are $20 for lower-level seating and $15 for upper-level seating; conference games are $22 for the lower level and $17 for the upper level. On January 14, when UAB hosts Marshall, youth tickets will be only $5. Samford also has an exciting season planned. For all Samford athletic events, kids 12 and under are admitted for free with a paying adult. 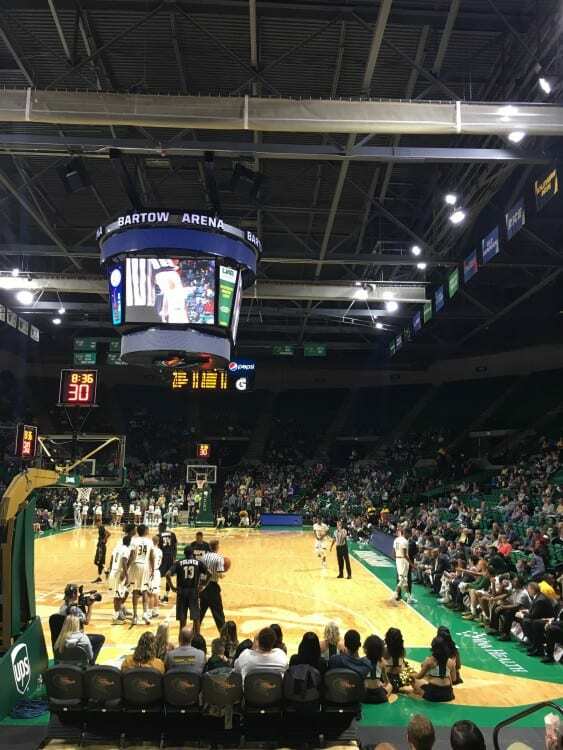 All UAB home games are played at Bartow Arena in downtown Birmingham, while Samford competes in the Pete Hanna Center off of Lakeshore Drive. For more information about Blazer basketball, visit www.uabsports.com or call the ticket office at 205-975-UAB1. To learn more about Samford basketball, visit www.samfordsports.com or call the ticket office at 205-726-DOGS. Complete schedules for both schools can be found online using the links mentioned above. Jennifer Wilson is a new Birmingham resident after moving to the area from Charleston, S.C. She is a mom of two girls, Brooklyn (22 months) and Blakely (3 months) and she loves exploring all that Birmingham has to offer. She’d love your ideas on what to do with small kids! Visit her blog at www.beagleandbaby.com.